You already know that eating fish is beneficial to your health in many ways. Getting at least two servings of fish a week, about 8 ounces, can prevent heart disease and diabetes, according to the 2010 Dietary Guidelines for Americans. So if it’s doing your body good, will it improve the way you look on the outside as well? Check out these 4 foods that are secretly aging you. “Yes, eating fish that contain omega-3s—oily fish like herring, mackerel, salmon, anchovies, and tuna are the best sources—can help your skin,” says Dr. Sonia Badreshia-Bansal, UCSF clinical instructor. There are three types of fatty acids, alpha-linolenic acid (ALA), docosahexaenoic acid (DHA) and eicosapentaenoic acid (EPA). Fish oil only contains DHA, which is responsible for the growth and functioning of the brain, and EPA, which is thought to protect the skin and fight wrinkles. Getting ample doses of EPA can prevent damage from the sun, according to a 2005 study in the Journal of Lipid Research. The study found that exposure to UV rays releases certain enzymes that damage collagen, the connective tissues that keep our skin supple, leading to lines and sagging skin. EPA blocked the release of these enzymes, slowing down the skin’s aging process. And because EPA is both an antioxidant and an anti-inflammatory agent, it has the added bonus of preventing sun damage and helping repair the skin once it occurs. Eat a delicious fish dinner, prevent wrinkles and repair skin? Sounds like a win-win situation! For those with skin disorders, omega-3 fatty acids may also help. Studies have shown that patients with sun sensitivities experience less sensitive skin after taking fish oil supplements (though it’s not a substitute for sunscreen!). Psoriasis patients may also reap the benefits of a fish-friendly diet: A small study found that people who took EPA in addition to psoriasis medication showed greater improvements than those treated with medication alone. But there’s more to fish than omega-3s. Seafood is also rich in selenium, a mineral that protects against free radical damage and may prevent everything from high cholesterol to thyroid problems. Though some studies have hinted that selenium supplements may prevent cancers, including skin cancers, the evidence is still inconclusive. ] Talk to your doctor to find out how much selenium they recommend for you. To get in 8 ounces of seafood a week, use these as guides: A drained can of tuna is about 3 to 4 ounces, a salmon steak ranges from 4 to 6 ounces, and 1 small trout is about 3 ounces. Swap ground meat or turkey for a salmon burger, add shrimp to stir-fries, make grilled fish tacos, or add clams to whole-wheat pasta. Make salads more interesting with grilled scallops, shrimp, or crab in place of steak or chicken. Use canned tuna or salmon for sandwiches in place of deli meats, which are often higher in sodium. 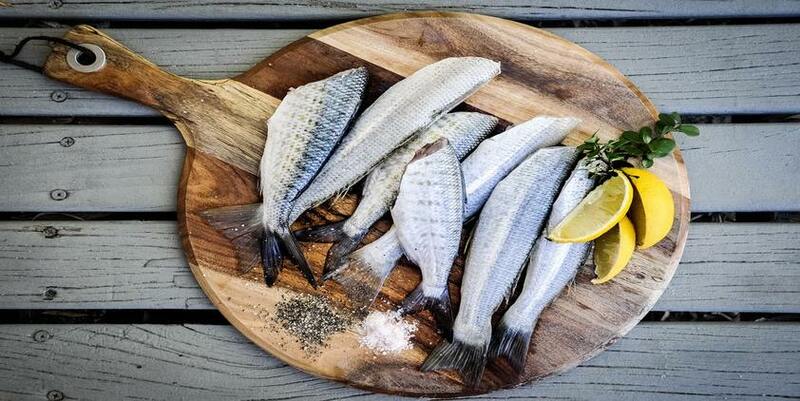 Experiment with new fish such as grilled Atlantic or Pacific mackerel, herring, or oven-baked Pollock. You can read the full article on HowStuffWorks.